December 17th, 2012, Ascot, UK: ZBD, the leading provider of fully graphic epaper display systems for retailers and industrial users globally, has announced that Samsonite®, the world's leading luggage brand, has selected ZBD’s epaper displays for the new Vending Machine concept it has developed. Officially unveiled in Cannes in October 2012, the first Samsonite vending machine is located alongside Samsonite’s new concept kiosk in Brussels Airport, Belgium. The project was undertaken by Media Wizz in cooperation with CREO Wireless Electronic Labels, ZBD’s partner in the Netherlands. The Samsonite vending machine offers a selection of Samsonite’s travel accessories, available to travellers day and night, including travel pillows, locks and luggage tags. The vending machine features a user-friendly touch screen and customers can easily and seamlessly select items and make payments via credit card. 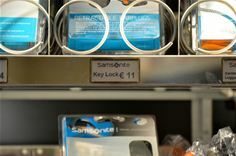 The Samsonite vending machine incorporates 25 of ZBD’s smallest epaper displays, the epop 50, which have been integrated into the shelves to show product and pricing information. Product information is updated by head office and can be managed remotely. A pioneer in the luggage industry, Samsonite has been at the forefront of design for the last century and is recognised worldwide for innovative travel solutions. The introduction of a contemporary kiosk and vending machine continues to push the limits of innovation by bringing offline and online retail together in an imaginative way and offering consumers the very best travel solutions to suit all lifestyles. Graham Carter, Vice President, Retail Europe and Distributors, Samsonite: “As we continue to innovate and prepare for the future, sophisticated consumers can really embrace the new world of virtual shopping with a visit to our new retailing experience. We selected ZBD’s epaper system for our new concept vending machine because the displays are clear and easy to read and the system allows us to update price and product information centrally from head office. In addition, the system requires no maintenance which is perfect for this kind of environment." Samsonite plans to roll out the new concept vending machines in airports across Europe over the coming year. Samsonite, created in 1910 by entrepreneurial Colorado native Jesse Shwayder, is the world’s leading luggage brand. Inspiring travel world-wide, Samsonite helps global travelers to cover miles and create memories with revolutionary travel solutions. Preserving the brands longstanding history of breakthroughs in research and development, Samsonite has embedded its place at the forefront of the travel world with a number of industry firsts. Showing commitment to innovation, the unique hard side collections made with the revolutionary Curv® material and the soft side ranges created with Advanced Hybrid Technology™ (AHT) join a wide spectrum of business, casual and personal accessory products in upholding Samsonite’s position as a market leader and trendsetter. Remembering past triumphs but always looking forward, Samsonite maintains a worldwide vision that continues to enable the traveler to travel further, with always lighter, stronger and innovative products at his side. Samsonite continually invests in new ways to engage and connect with global travelers. An active YouTube channel, interactive Facebook games and a travel app provide a wealth of resources, connectivity and entertainment for today’s on-the-go travelers. By identifying trends and interpreting the continuing evolution of world travelers’ needs, Samsonite plays a pivotal role in the multi-faceted lives of the global traveler.